If the computer was a human being, the CPU would have been the brain. 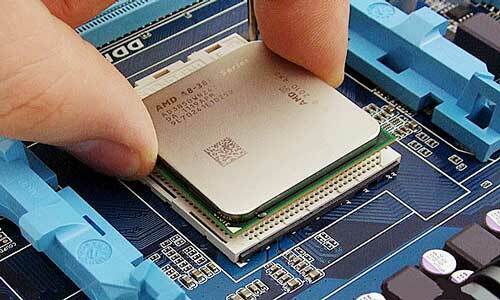 The abbreviation CPU stands for Central Processing Unit. The word central in this description is quite telling. It indicates the central place that the CPU plays on your computer. This is where all the instructions are encoded and decoded. It is the reason behind the computer knowing what it is being asked to do. If you think that the processes on your computer are logical, you should thank the CPU. If your computer can do some basic arithmetic, you should also know that it owes this to the CPU. Can you imagine how long it would take to do some of the tasks that your computer can do in seconds? For example, if you were to try and calculate the salaries of a million employees, enter their leave days and calculate their tax manually, you would need a whole year to do the work that your CPU could do in a few seconds if your computer is installed with the right programs. If you look at the amount of information that your computer processes, you will have an idea of the importance of the CPU in your computer. Using a sequence, the CPU encodes and decodes all the information that is fed into the computer. The results that your CPU gives you depend on the validity of the program that you are using. To understand this function, you must review some of the tasks that your computer does. When you want to read information from an external port, it is the CPU that will make this possible. These external ports allow the CPU to extend its capacity to do other important function. For example, if you wanted to print something which is on the computer, it is the CPU that tells the printer that the print command has been given. Since the CPU is such an important aspect of your computer, it is important to look after it well. Part of this involves ensuring that it is always clean. Saying that the CPU should be cleaned does not imply keeping it physically clean. Well, keeping it physically clean from such things as dust is a given. It implies getting rid of unnecessary files that can clog the system and leave it unable to function properly. Such programs like DriverAssist do not only ensure that your drivers are always u to date, they also ensure that the software on your computer can protect your CPU from threats that are caused by issues related to overheating. The software will scan the system and ensure that unnecessary caches are not slowing you down. It is designed to make sure that you spend your time doing the real important tasks that generate revenue for you as opposed to spending time worried whether your CPU is properly protected.